Futayo is ready to fight ! Kotobukiya proudly presents a new ani statue from the popular series HORIZON IN THE MIDDLE OF NOWHERE with the FUTAYO HONDA Ani Statue. 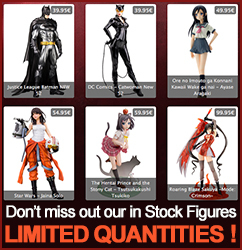 Futayo stands 22cm tall in a beautifully sculpted 1/8 scale, perfect for collecting. Holding her weapon ready in her right hand and her left hand hovering over the hilt of her sword, Futayo is ready to fight ! She looks great in her black and blue outfit, with her hair and robes flowing in the wind. Display Futayo on her own or alongside other Ani Statues based on character from Horizon in the Middle of Nowhere (sold separately), coming soon !